Analysis of recent economic data suggests that the property market of several lower profile Australian cities have more to look forward to than our most populous cities. Of all capital cities, recent economic data adds to a building list of positive indicators suggesting that the outlook for Hobart remains superior to all other capital cities. Meanwhile, there’s a healthy list of regional cities with economic trends which also catch the eye of our analysis. According to official data published by Australian Bureau of Statistics, the increase in jobs in Hobart over the last 12 months is four times higher than the national average and more than double every other capital city. 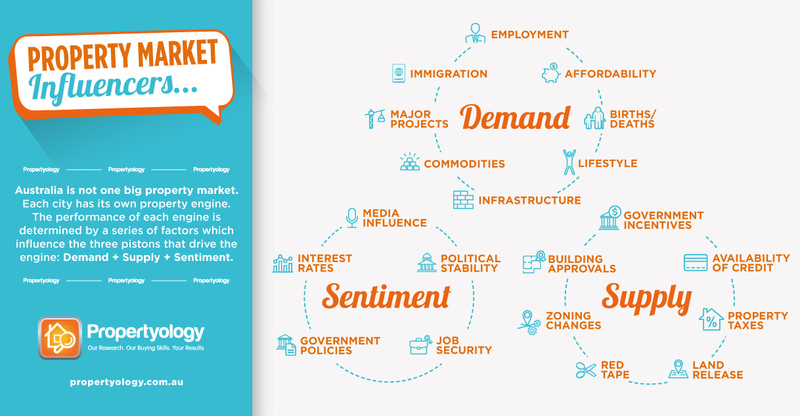 Employment trends are often a precursor to property market trends; this chart helps illustrate our point. Sydney (home to 21.2 per cent of Australia’s population) and Melbourne (18.7 per cent) have arguably been the only two locations in Australia where property markets have performed strongly over the last four years and it’s no coincidence at all that these two cities produced 57 per cent of Australia’s total job creation over the same period. The relationship between percentage of national job creation and percentage of total Australian population for all capital cities is remarkably consistent with how respective property markets have performed over the last four years. ABS data confirms that Australia continues to produce steady employment growth with a 2.1 per cent increase over the 12 months ending May 2017. There can often be a lag of 12-18 months before what’s occurring on the jobs front is materially reflected in real property data. At a base level, property is shelter. Wherever there is demand for more jobs in the future there will be demand for more shelter! This core philosophy is something which is engrained in Propertyology’s psyche (we place more emphasis on economic trends than property-specific data). There was an 8.4 per cent increase in jobs in Hobart over the last 12 months. Recently released data by both Core Logic and Domain confirm that Hobart had the biggest increase in median property values of all capital cities over the last 6 months. It was a classic case of ‘daylight second’ in the ABS jobs race with Melbourne producing a 3.5 per cent increase, followed by Adelaide (2.2 per cent). Growth in Sydney and Canberra was equal to the 2.1 per cent national average. The correlation between employment growth and property market performance was again evident in Brisbane (1.3 per cent ) and PerthPerth, TAS Perth, WA (0.6 per cent), both below the national average employment growth rate, while Darwin saw a 0.8 per cent retraction in jobs. The anticipated continued improvement in Tasmania’s economy influences Propertyology’s forecast for Australia’s most affordable capital city to continue to be the nation’s best performer for quite some time yet. Changes in job volumes at an individual city level ~ as opposed to just looking at an unemployment rate in isolation ~ provides more insight in to future performance of property markets. Propertyology’s analysis of every local government jurisdictions across Australia uncovered some encouraging signs for parts of regional Australia where 8 million Australians elect to live and work. There are several regional cities with extremely affordable housing and good economic outlooks that Propertyology is actively helping our clients invest in today. The biggest increase in job volumes in Australia over the 2 years ending May 2017 was in the Victorian regional city of Geelong. 22.3 per cent growth is off the charts although we do note a retraction in jobs of 3.1 per cent over the last 12 months – a sign that perhaps the best buying times in Geelong are behind us. The regional city of Shepparton, where a typical house only costs approximately $250,000, has sustained employment growth of 19.1 per cent over the last couple of years. Our Research Report contains more insights about Shepparton’s property market. Bendigo (6.3 per cent) is another Victorian regional location with solid jobs data. Infrastructure expansions such as the airport and hospital along with good growth in the retail and tourism sectors are behind the 21.6 per cent growth in Dubbo’s employment. 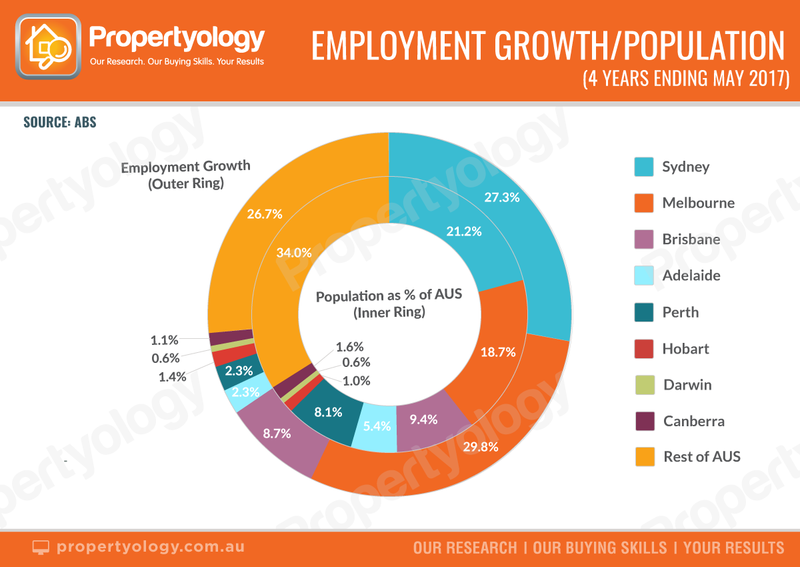 Newcastle, arguably the most consistent property market performers in all of Australia over the last decade, produced 12.6 per cent growth in job volumes over the last 2 years. Employment growth of 9.4 per cent in Mid-North Coast (Port Macquarie) last year was also significant. Meanwhile, Coffs Harbour (10.2 per cent) and Shoalhaven (25.1 per cent) both saw a significant retraction in jobs over the last 12 months. Green shoots are appearing in a few Queensland regional cities, too. As detailed in Propertyology’s Townsville Market Report, there’s a big bunch of reasons for optimism in Australia’s thirteenth largest city. The 12.7 per cent increase in jobs over the last 12 months is the start of what shapes as a significant revival. A very solid 12 months has also unfolded in Mackay (7.6 per cent growth), Beaudesert / Logan (10.2 per cent), and Toowoomba (12.8 per cent). The 6.3 per cent employment growth for the year ending May 2017 in Cairns, Australia’s gateway to Asia, is likely to further accelerate in coming years. In addition to economic development (jobs), the factors which have the biggest influence on property prices are affordability, sentiment, and supply. It’s never ONE thing which we base our investment decision on – it’s the sum of all of these things which determines whether or not a location gets our green light!